The Bella Collection 981 King Bed has a low footboard and a classic style you are sure to love! This gorgeous, king-size bed has full panels to encase the entire mattress, giving off a cozy feel ideal for relaxing. This Amish-crafted bed has a curved, sleigh-style headboard with beveled panels to give just enough structure to the piece. This handsome bed frame is available in several wood options, including oak, cherry, and maple (pictured in cherry), and comes in a range of finishes to match any color scheme or design feel. This beautiful, American-made bed is part of an entire collection of Bella solid wood furniture from Barn Furniture Mart, and is a fitting match to the dresser, nightstand, or chest in the collection. 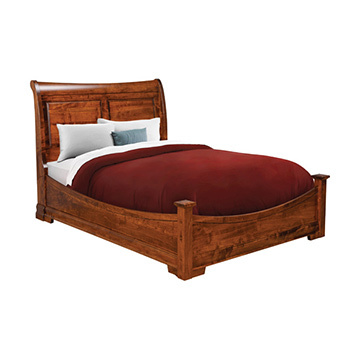 Like all of our solid wood furniture, this king-size bed is constructed to be water and stain resistant, is made in the USA, and comes with a satisfaction guarantee!